�My baby! She�s floating in the water!� The young mother rushed down the beach where other kids from church were swimming. She reached into the ocean and pulled her floppy, unresponsive 1 yr old doll-like child into her arms. This little girl had been through so much pain. Four bulging round black boils protruded from her little brown feet, and scars from dozens of scratched mosquito bites made a mosaic on her bare legs. Billy (the mother) stuck her finger into her tiny girl�s mouth, and after the child threw up, clarity came back to the little one�s eyes. Her mom sat there in the sand for ten minutes, just lovingly rocking her girl back and forth in her arms. Tears of joy trickled down her cheeks. Billy was one of the eight candidates for baptism. Oh, how Satan would love to have spoiled this Sunday with such a tragedy! Yet this particularly special Sunday was protected by your prayers. Four young mothers followed the Lord�s command in baptism. Also a husband and wife from the unreached Ata tribe, a grandmother and a teenager. you feel you can stop the rain. 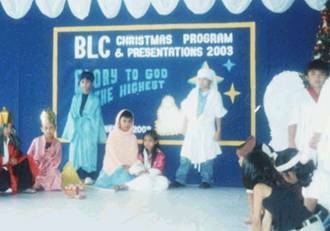 BLC PUPILS ENACT THE NATIVITY WITH ANGELS, SHEPHERDS, WISE MEN�EVEN DONKEYS! �I think it is time that we plant a daughter church!� Presenting to the church board the need to start a new church plant, I suggested an unevangelized area 4 miles away, called Purok Ocho (Village Eight). It is an urgent need, as many in the church are squatters who have recently been relocated. Also, planting a daughter church will help our new believers grow in Christian responsibility, exercising their Spiritual gifts. Together, our board discussed what prerequisites will be necessary in our present 6-yr old church before we are strong enough to plant a daughter church in Purok 8. First, we need to increase our annual budget to be able to financially handle the additional salary of a church planter and his parsonage for a year. This we will achieve by preaching each Sunday in 2004 on a different faithful believer mentioned in the Bible. We will focus especially on their sacrifices, challenging these new believers in Davao to also sacrificially give to God. Second, although we average 150-180 each Sunday, a third of those are children and toddlers. Therefore we�ll need to have a strong prayer base of 100 adult and youth members before planting a daughter church. To date we have 62 adult members. Praise God for the Godly church board He has given us. Through them the Holy Spirit clarifies the procedures necessary to carry out the vision and goals that God has placed upon my heart! DO YOU HAVE A NEW YEAR'S PROJECT? �Who do you see?� I asked the question to the nursery through Grade four BLC students and their parents. 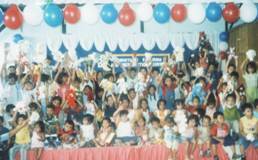 They were gathered for the kids� Christmas presentation. As always, I took the opportunity to share the Gospel.